about 1 cup coconut cream low-grade olive oil for frying and Styrian Gold Pumpkin Seed Oil for drizzling. Chop the onion, and start frying it in a thick-bottomed pot on a medium flame, with a little olive oil. Once the onion becomes translucent, add the garlic cloves, coarsely chopped and add the spices. Peel the pumpkin and chop it into cubes, and add it to the pot along with the water. Cover and let simmer until the pumpkin is soft enough that it breaks apart with a fork. Then turn off the flame, add the coconut milk and most of the parsley and blend with a stick blender. 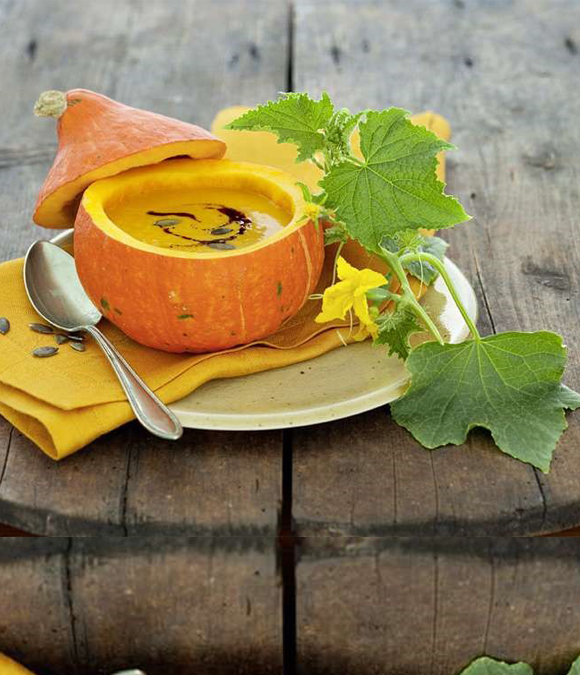 Add the rest of the parsley and the Styrian Gold Pumpkin Seed Oil, so that the soup has flecks of green and brown color, or use them to top the individual bowls.